< 100 Face Challenge: Studio Cat (#6 & #7)! Aw, thanks Tom, I really appreciate that! I hope you enjoy that channel. He started out wanting to be in medicine and he always works lots of anatomy info into his figure work. I think you’d really enjoy him. I really love the simple lines here. You really captured it. Thanks! It was fun and worth trying! It’s so rewarding – and a challenge – to capture something with a minimal line. You certainly did it here. Thanks, Michael! It was fun. Wow, thanks Kerfe and thanks for that link! Thurber is great. Although he seems to be off the radar a bit at the moment. Yippee! 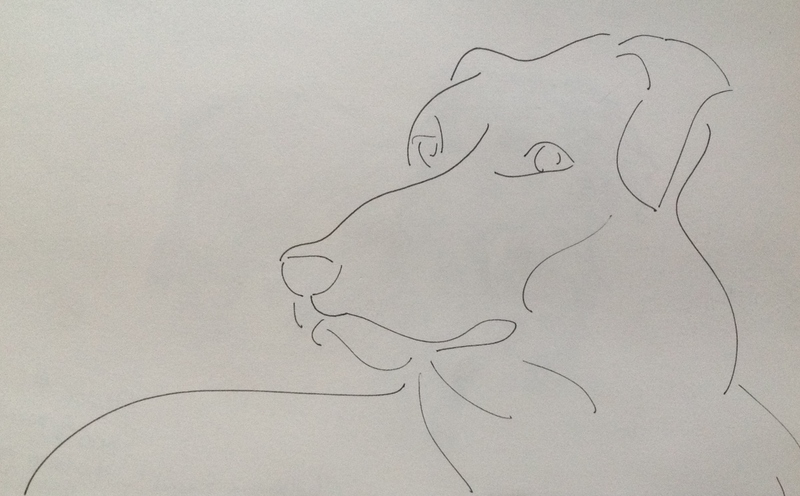 I knew it in my heart, but didn’t want to presume Charlie and I were so lucky to get him drawn so distinctly! You totally capture his lines! I ADORE it sweet Laura! You ARE becoming such a strong artist to be able to do this with just a few very distinct, very strong lines. BRAVO Artista! Thanks, Veronica! Don’t miss his YouTube material too. He has a way about him that is so motivational and easygoing. I just love him. Such a wonderful teacher too! Less is more Laura. I LOVE this drawing. This fellow has such confidence and attitude. Thank you for the kinks to Alphonse, I will check out his lessons. Keep practicing you are on an amazing journey! Basics! Great way to see and do for a fast moving subject. I like it. And thanks for the YouTube source. Thanks, Teri! Glad you got something useful there. I just love Alphonso’s videos. I hope you will too. I just watched Alphonso on YouTube. I can see how he inspired you because he did me too. I’ll be watching more. Thanks. I’m so happy to hear this, Teri! Thank you! Thanks, Snehal! I was in the zone that day. Glad you like it! Thanks, Charlie! Glad to be inspiring you for a change! 😀😊 Alphonso is awesome. You’ll love him. Thanks so much, Iris! Glad you liked it! I’ll have to look up Calder. I do see! Thanks, Iris! Thanks, Carmel! I’m so glad you like him too! He has tons of stuff on the figure, as I’m sure you know. I did start to see him on the Strathmore side too and Sakura even has him do videos. Every now and then you see his face and he is just so cool. So much joy there. I just love listening to him. I love his way and he is a great teacher! Also I’m really glad you liked this sketch. It surprised me. I tried to do a few more and they didn’t have the same immediacy but I’d like to try more though because when it works, I really like the effect. Simplistic and beautiful lines Laura. Thanks for the link, I will check it out. Awesome, Mary! I’ll be curious what you think! Glad you enjoyed this. Awesome, Teresa! I think it would be much harder when you’re trying to get a likeness on a human face, and you are really a master at that with your Jeopardy players. You make it look easy, but particularly when you’re not pausing, and trying to capture in so few strokes…..it’s not easy at all. I’m glad you enjoyed this! I was surprised by how well I liked it. I tried more and didn’t like them as much. The key is not to think. When I thought I would improve on it by thinking it through, nope. Just got too involved and lost the spare beauty. You probably already know this but this is what I learned from this exercise. Sweet and simple lines. Beautiful. Thanks, Julie! Much appreciated. This would be a cool concept to try with a horse. Yes it would. Back in the 1970s I had a white silk dress that had horses on the fabric. Each horse was painted with a single black paint stroke. The horses were sporadically placed on the fabric. Each horse had red eyes. I wish I still had this dress to show you what I’m talking about, but it was my favorite dress. It also would have been a beautiful silk scarf as well. Ooh that does sound really neat, Julie! Thanks so much for the link, Julie! Boy, Julie, you weren’t kidding. THANK YOU for letting me know about this one! Great drawing – thanks for the link! You’re quite welcome! I hope you enjoy it! Few lines Laura however you have captured the eyes beautifully to hold the viewer. Eyes are definately becoming your strength. Thank you so much, Denis! I really appreciate your kindness! Thank you so much, Graham, for your comment! Your encouragement means a lot; I’ve looked up to you from the start. I love this! Reminds me of some of Picasso’s very simple line drawings – so rich! Wow, thank you!!! So kind of you! Love it! I will check out your link. Thanks for sharing! You’re so welcome, hope you enjoy! Oh I love this one Laura, it works so well….. I need to do more of this less is more thing. Well done, you put done the ink at the right time. This would look great in a simple black and white frame, with a wide mount. Wow, thanks, Rebecca! It may have been beginner’s luck, as subsequent tries weren’t nearly as good. I started thinking too much! But it was so cool and I’d love to perfect this technique. Well you definitely nailed it with this one. It is hard to pick the important lines, and still have a recognisable piece, I’ve yet to master that skill. Thanks very much! I may have lucked out a bit with this one, but I was happy with it. Sometimes I feel sitting down to draw or sketch is like rolling the dice. I often don’t know what’ll happen but it’s always fun to find out! Totally agree, some days it just does not work…..I put those aside, and usually find I can rectify in a week or two, as I look at it differently, and forget my original intent. Some are still sat here from 6 months ago, really lost with them, but not given up for the future, they could have some luck with inspiration. Been painting tonight and found I have painted from one of my photos, which I have done before! Grrr although it is different, in that the horse has changed colour. Quite a bit of work to do before finished. I’m sure it’ll be beautiful, as your work always is, Rebecca!